Cushions have been around since biblical times. They have always been an envelope of material into which some soft material is placed to provide the cushioning. The materials used for cushioning have ranged from leaves, straw, wood shavings, wool, foam, liquid and air, to name a few. The only difference between most of the cushions of today and those of biblical times is the cushioning material inside the cover. The cushions of biblical times as well as the cushions of today all have worked exactly the same way. When a client sits on the cushion, their weight goes straight down until they hit bottom or have reached the extent of what the cushion will allow. All of these cushions shape themselves perfectly around the client’s posterior and continue to put upward pressure against the client’s posterior. Enter EquaGel® cushions, the only cushion designed to keep the client SITTING ON TOP of the cushion while relieving for pressure points such as the ischial tuberosity’s. In other words any client of any weight or shape will never hit bottom on an EquaGel® cushion. EquaGel® is a dry-polymer gel, almost rubbery. It is not a liquid! One of its most amazing features is referred to as “COLUMN BUCKLING”. Simply put, each wall of gel is capable of supporting only a marginal load. When that threshold is exceeded, the wall buckles under and passes the weight to the surrounding walls for support. This “buckling and weight-passing” happens instantly and repeatedly until the maximum surface area of pressing weight is evenly supported by sufficient walls to hold the weight up, regardless of its shape. The pressure points of the ischium and coccyx are allowed to buckle into the cushion without resistance while the buttocks are supported evenly. The areas most likely to develop pressure sores are allowed to float nearly pressure-free within the pad while the client’s weight is distributed evenly across the cushion. Additionally, the open cell design of EquaGel® cushions provides for air-flow beneath the client. Hence an EquaGel® cushion provides the client with a temperature neutral environment. The client should never experience a build-up of body heat that ultimately creates perspiration as occurs on foam, liquid gel and air cushions. Hence, EquaGel® cushions practically eliminate the three factors most commonly related to the formation of pressure sores – pressure, heat and moisture. EquaGel® cushions are the first cushions since biblical times that actually perform differently than all the cushions that preceded them. Instead of allowing the client’s weight to go straight down until he/she hits bottom, the EquaGel® cushion distributes the weight evenly across the top of the cushion. No other cushion performs like an EquaGel® cushion for extended comfort and superior protection. Since 1997 Allegro Medical has been a leading supplier of wheelchair and seating cushions to healthcare providers and consumers. 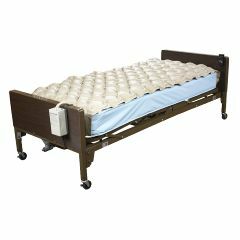 If you are looking for a more comfortable and reliable cushions, rely on AllegroMedical.com for all of your needs. Written by Dave Paul from EquaGel. 2016 is a new year for resolutions and for many that #1 resolution is to get in shape. Pairing with that resolution usually is a membership to one’s local fitness center. According to statista.com, 2014 had over 54.1 million memberships at fitness centers/ health clubs up from 32.8 million back in 2000 (1). This means that over 17% of the US population is currently enrolled in a fitness center. Now enrolling is the easy part, the hard part is actually attending and making the most of it. There are many hidden benefits to exercise that most overlook. As you work out, your lungs are getting stronger, your motivation is at its peak, and when you push yourself harder your body blasts through fat cells as its source of energy (2). Did you also know that working out assists to protect yourself against colds and flus? “Every sweat session you do can help strengthen your immune function for about 24 hours,” says Cedric Bryant, PhD, chief science officer for the American Council on Exercise. It is easy to start making excuses 2 weeks into your journey such as time, the gym is too crowded, I work in an office all day, or even sheer lack of motivation. Here at Allegro Medical, we feature items that many probably didn’t know are available that counter any excuse. You don’t always need heavy weights to strength train. 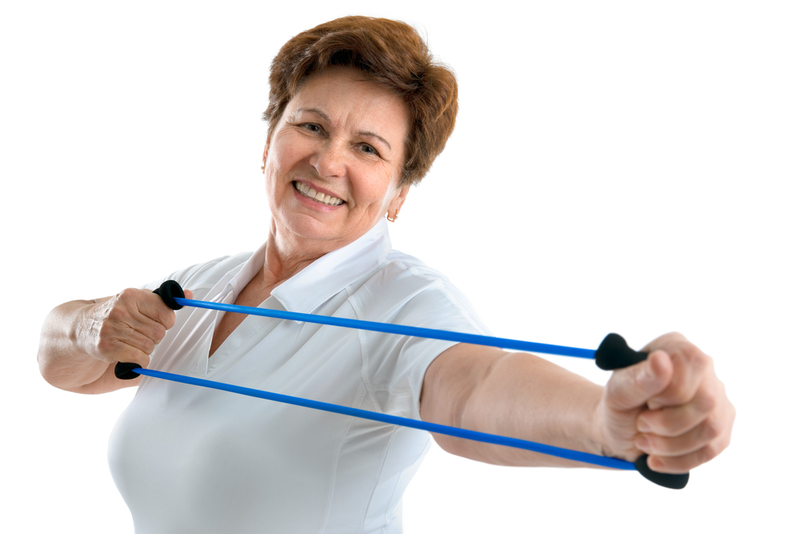 Xertube resistance bands work well and have many uses and target everyone’s personal fitness level. Often people reach for resistance bands to work out as these strengthen the core of your muscles due to the bands resisting more you pull more. You only need a little space to begin a safe, effective total body workout. You can work out sitting, standing, laying, or even walking! 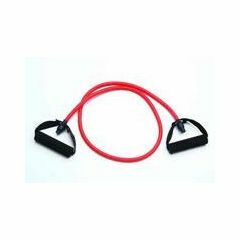 Check out many other resistance bands and tubes that are for sale! Aids in keeping me flexible. Always handy when I feel like I need some exercise. Can be used in many ways with hands or feet. 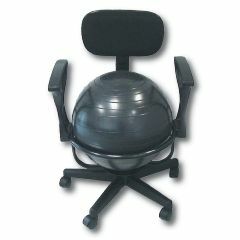 This Cando ball chair is a top seller for office workers. Now you can sit stationary and exercise quietly with some low impact movements. You are able to move your lower core to burn calories, strengthen your core muscles and back, and improve posture. 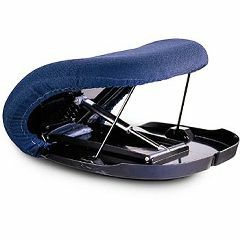 This chair goes past just pure stationary exercise; it can be used for therapy as well at home. Add steps to your days and count with a pedometer! 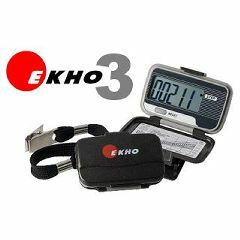 The Ekho THREE Pedometer helps you reach your fitness goals by delivering all your relevant workout data on a large, easy to-read LCD display, at the touch of a button. Pedometer calculate how many calories burned and even gives you step goals! Many office employees average only 1,000 to 3,000 steps a day. It is recommended to try and walk 10,000 steps. That seems like quite a lot but you can break down these steps into a couple of smaller obtainable chunks. Grab a walking partner and fit in 1,500 steps during break in your day. Take a mile walk with your pet which is only 2,000 steps. Use the stairs at stores or work or even park further away in the parking lot. Check out other pedometers we have available. Since 1997 Allegro Medical has been a leading supplier of exercise and fitness supplies and equipment to healthcare providers and consumers. If you are looking to get fit with helpful exercise tools and supplies, rely on AllegroMedical.com for all of your needs. 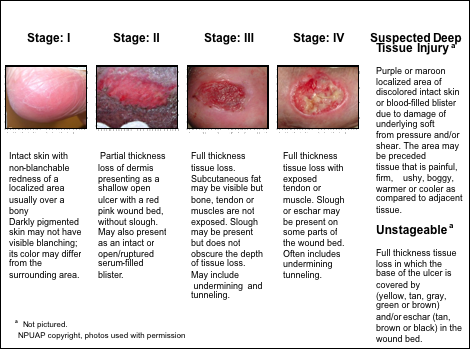 A dermal ulcer is a sore that develops on the skin followed by destruction of the tissue surrounding it. Tissue destruction leads to complete loss of skin; the size and depth of the ulcer depends on the severity of what exactly is causing it. Dermal ulcers are more common on the skin of the arms and legs. Your first inclination of any compromised skin areas should come if you notice an area where the skin has an increase in redness and warmth, as compared to the skin around it. This should warrant immediate medical attention to determine any possible underlying causes in order to reduce your chances for more complications or recurring skin issues. Keep in mind also that serious complications, such as infection of the bone or blood, may occur if the dermal ulcer progresses without treatment. • Wounds are NOT open. Despite the skin being painful, there will be NO breaks or tears. • Skin will appear red and will NOT blanch (lose color briefly if you apply pressure with your finger…it will stay red). • If an individual is darker-skinned, the area may appear to be a different color than the surrounding skin…but it may not look red. • The skin will also feel warmer to touch than the surrounding areas. • Area may feel either more firm or softer than the surrounding areas. • Wound is now open. The skin breaks open, wears away, or forms an ulcer. • This will be tender and painful. • Area now expands deeper into the tissues of the skin. • Will appear as a scrape, blister, or even a shallow crater in the skin. • Some skin may be damaged beyond repair and may die off. • Ulcer continues to worsen and extends further into the tissues. • A crater in the skin will definitely be noticed here. • Fatty tissue may also be noticed. • NO muscle, tendon, or bone will be exposed at this stage. • May be little to no pain due to significant tissue damage. • Ulcer is very deep, reaching down into muscles and bones. • Results in extensive damage and long, complicated processes for healing…if damage can even be reversed. • Damage may occur to deep tissues, tendons and even joints. Your doctor will diagnose your dermal ulcer according to the criteria above to develop a treatment plan for you to cope in your day to day life. The main goals of treatment for dermal ulcers are aimed at avoiding any possible infection that could occur, maintaining an overall moist environment for healing, and easing any pain. 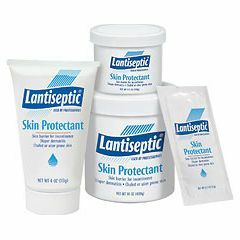 Lantiseptic Skin Protectant is a unique high-lanolin emollient ointment intended to protect chafed or ulcer-prone skin, promote the healing of skin injuries and serve as a first aid treatment. It is formulated to encourage the proper moisture balance of the skin, thereby supporting the body’s natural healing processes. The Med Aire Variable Pressure Pump and Pad is made for distributing pressure points helps alleviate bed sores and other discomforts associated with constant pressure on the skin. This pad measure 78″ x 34″ and features a whisper quiet pump. It can safely support anyone up to 250 pounds and do wonders to increase circulation and reduce the incidence of decubitus ulcers. Comes in either standard or deluxe. Standard lays on top of your mattress, deluxe has flaps that help hold the pad securely in place. 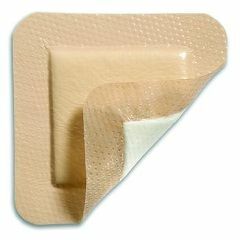 Mepilex Border is an all-in-one foam dressing that effectively absorbs and retains exudate and maintains a moist wound environment. The Safetac layer seals the wound edges, preventing the exudate from leaking onto the surrounding skin, thus minimizing the risk for maceration. The Safetac layer ensures that the dressing can be changed without damaging the wound or surrounding skin or exposing the patient to additional pain. In order for a dermal ulcer to heal properly, any dead tissue needs to be removed first. Then it is essential to keep the area clean to prevent any infection. Prevention of infection and pain can be managed with several different medications such as antibiotics, muscle relaxants and non-steroidal anti-inflammatory drugs such as Aspirin, Advil, and Motrin for example. Reposition yourself frequently to enhance blood flow and reduce the amount of pressure that is being put on certain skin areas. Do your best to avoid being in the same position for too long. Take breaks, move around often and reposition yourself when lying in bed. Using special cushions can also help. There are special pads, mattresses and hospital beds alike that can prove to relieve pressure either on good skin or those areas that already have a dermal ulcer present. Their goal is to protect your vulnerable skin from any possible damage. Maintaining a healthy diet and exercise regimen. Healthy diet habits can keep you at a healthy weight and decrease your risk for more chronic conditions that could lead to inadequate circulation and formation of dermal ulcers. Good exercise regimens can keep your blood flowing and help you also maintain an optimal weight. Ultimately, dermal ulcers can range from being very minor to causing several complications. You know your body the best, so at the first sign of your skin showing an abnormality do not hesitate to consult with your provider just to be safe. The quicker you start treating your dermal ulcer, the quicker the healing time and the better the chance you will have at avoiding complications. Since 1997 Allegro Medical has been a leading supplier of dermal ulcers supplies to healthcare providers and consumers. If you are recently experiencing symptoms of dermal ulcers, rely on AllegroMedical.com for all of your dermal ulcers needs. Through my years of working as a physical therapist in the home, I have seen many patients struggle with the fight to maintain their independence. We all want to be able to make our own choices and come and go as we please but unfortunately age and injury can put a damper on our plans. Surgeries, injuries, illness and age bring challenges that can slow down the coming and going that you had been planning. Something as simple as getting in and out of the house used to be a task you never thought about. You bounded up the steps and through the doorway with ease. Often you even carried groceries, laundry baskets and laughing, upside down toddlers with you. Now though, if your knees hurt or your balance isn’t so great it can be a very dangerous endeavor just to get yourself up the step and through the door. We probably all know someone, elderly or not, that has fallen on or down the steps and has been severely injured. According to the Centers for Disease Control and Prevention (CDC) one out of every three people over the age of 65 fall each year! Once a person falls it is usually a downward spiral that is difficult to come back from. In fact, the CDC also warns that 40% of people who end up in a nursing home due to a fall never return to living independently ever again! Even the folks that do return to their prior level of function and independent living status have a lingering fear of falling again which can keep them from doing the more active things that they enjoy. The Flip A Grip is a device that can be installed in your home so that you can avoid being sent to “the home”. The Flip A Grip is a patent pending device I designed for my physical therapy patients that needed that extra support when going up and down stairs or transferring. It is a sturdy handle small enough to fit in tight spaces, like doorways, and folds out of the way when you are not using it. Each Flip A Grip is 100% handmade in the USA, comes with the mounting hardware and even glows in the dark to help in low light situations. 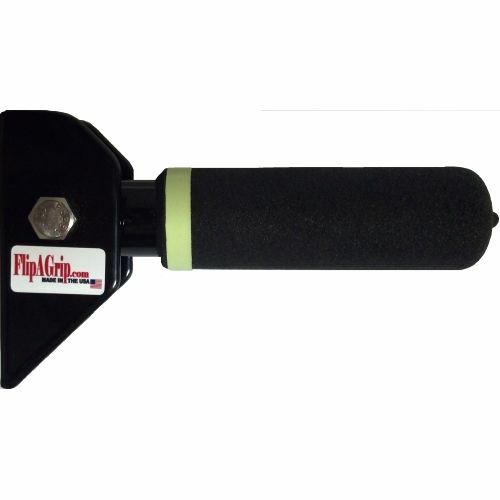 The Flip A Grip is simply a strong, foldable handle small enough to fit in between a storm door and an exterior door and is perfect for folks that don’t have the strength, balance or confidence to get in and out of their home safely on their own. The idea for the Flip A Grip began in 2012 when I was working as a physical therapist in home care. I was treating a lady who had broken her hip and had had surgery to repair it. We worked at improving her strength, balance and mobility and eventually she was able to get up and down her steps from her garage to her back door. With all of her hard work though, she still could not get up that final step to enter the door into her home. 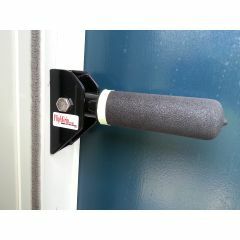 She would grab for her walker or the door, or the door casing and trim but nothing made a good enough handle to push on. Her hand rails were too far behind her and she needed that extra boost with her arms to get herself into the home. I went to our local home medical supply store to buy something that might help her. The item I had in mind was not for sale though, so I became an inventor! I carved the first prototype out of a broom handle and a closet organizer bracket and the adventure was on! I designed at least ten different prototypes until arriving at the model you see now for sale on AllegroMedical.com. The Flip A Grip has arrived on the scene and the world is such a brighter and better place because of it. That’s a little bit of exaggeration, but I do think we have a pretty great little device that has been a blessing to those who have started using one. Folks that will find the Flip A Grip helpful are those with decreased strength and balance, those who have difficulty standing from a seated position or that find ascending or descending steps safely a challenge. People who simply have aching joints that make stairs and transfers painful will also love the Flip A Grip because it helps take the pressure off those painful joints. Finally, if I’ve done a poor, longwinded job of giving you a straight answer to the original question- What is a Flip A Grip, I apologize. Here’s the abbreviated version for those of you, like me, that like a straight and to the point answer: The Flip A Grip is a sturdy handle to help prevent falls and make steps and transfers easier. It’s better than a grab bar in certain situations because its small, glows in the dark and folds out of the way. If you buy one, I really do think you’ll find that it helps a great deal. I’ve had lots of people say that they don’t know how they ever got along without it. 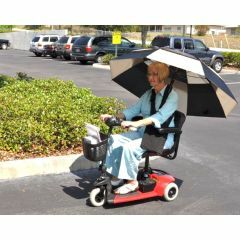 Since 1997 Allegro Medical has been a leading supplier of assisted living aids healthcare providers and consumers. 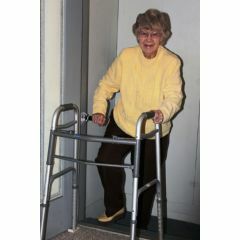 If you have recently undergone physical therapy, rely on AllegroMedical.com for all of your assisted living aids needs. Are you suffering from heel pain? You should know that plantar fasciitis is one of the most common causes of this. The plantar fascia is a thick band of tissue that runs across the bottom of your foot and is responsible for the connection between your heel bone and your toes. This tissue is normally expected to be your shock absorber step after step. However, if the tension on this tissue becomes too intense, small tears will be created. Then, as the repetitive motions continue it will result in more and more tears and stretching causing plantar fasciitis to occur from the increased inflammation the plantar fascia tissue is facing. Stabbing pain in the bottom of your foot near the heel. Pain that is usually worse with the first few steps after waking up. Pain that is triggered by long periods of standing. Increased pain when getting up from a seated position. If you begin to experience any of the symptoms as listed above it would be a good idea to consult with your doctor for possible treatment options. This is because if plantar fasciitis is ignored it may result in more chronic heel pain that could begin to interfere with your daily routine. In addition, if you try to compromise and change the way you walk to relieve your discomfort you may end up causing more pain in your feet, knees, hips or back. Do not put off your pain; get to the bottom of it before it causes you more trouble than it’s worth. Most commonly this condition affects those between the ages of 40 and 60. If a lot of stress is placed on your feet during exercise it can greatly contribute to plantar fasciitis. Such exercises could include long-distance running and ballet. Try lower impact sports such as swimming or bicycling. If you are flat-footed, have a high arch, or even an abnormal walking pattern…this can affect the way the weight is distributed over your feet and can add extra stress on your plantar fascia tissue which will cause discomfort. Choosing supportive shoes will help here. Avoid high heels and going barefoot as much as possible. Shoes with a low to moderate heel with good shock absorbency are the best. Those who are overweight may be at a greater risk just due to the extra pounds that add to the tension on the plantar fascia tissue. Working to maintain a healthy weight will minimize the stress placed on your feet. Your job may place you at a greater risk if you are expected to be on your feet for long periods of time…over time this may damage your plantar fascia. Take breaks often; either get up and move around or sit down and take a load off…your feet will thank you! The good thing is that there are normally no imaging tests necessary to diagnose this condition. The diagnosis is usually made solely based on the history and physical examination. As far as diagnosis of plantar fasciitis goes, if you consult with your provider related to your foot pain you will have a physical examination where he or she will check various points on your foot for any tenderness. The location of your tenderness and pain will help determine what is causing it. On rare occasions, your provider may recommend an x-ray just to ensure your pain is not caused by another problem such as a bone spur. Mild pain relievers such as Advil, Motrin, Aleve and others may help with the increase in pain and inflammation that is associated with plantar fasciitis. Physical therapy may provide you with instructions to complete various exercises to stretch your plantar fascia to help relieve your discomfort and better support your feet. Orthotics may also be an option too. These are custom-fitted arch supports that are placed into your shoes in order to provide better support for your feet. Combine the shock absorption of Tuli’s patented “waffle” design heel cups with the comfort and support of lightweight neoprene ankle support and you get unsurpassed support with amazing “barefoot” feeling and comfort. Tuli’s Cheetahs are ideal for shin splints, tired and swollen ankles or just a little extra ankle support. A proven favorite of gymnasts and dancers world-wide, Tuli’s Cheetahs are perfect for athletes. The first of its kind to bring trusted technology and style into one transformative solution, Vionic footwear offers innovative, podiatrist-designed support built seamlessly into contemporary and modern classics. Whether you are suffering from plantar fasciitis, knee pain, back pain, or other foot pains, you will find comfort in your shoes that you never thought was possible. Vionic sandals, shoes and slippers are biomechanically engineered to hug your arches, which supports natural alignment. If the more conservative options as listed above do not fully take care of your plantar fasciitis pain, you could be a candidate for more invasive procedures, such as surgery or steroid injections to help correct your problem. Ultimately, plantar fasciitis can indeed be a nuisance and cause you to miss out on some of the things you enjoy. Don’t ignore your pain; get it figured out as soon as possible in order to avoid more problems in the future. Taking care of yourself is the first step to your own happiness so what are you waiting for? 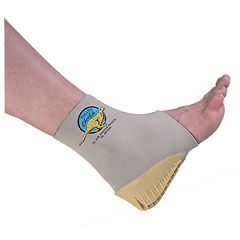 Since 1997 Allegro Medical has been a leading supplier of plantar fasciitis supplies to healthcare providers and consumers. If you are recently experiencing plantar fasciitis pain, rely on AllegroMedical.com for all of your Plantar Fasciitis needs. A hip replacement is a surgical procedure that is completed by a healthcare professional with the goal of removing damaged sections of the hip joint, and replacing them with foreign parts that are usually created from metal and/or very hard plastic to create an artificial joint. The artificial joint will ultimately result in decreased pain and improvement of function for the individual involved. An individual may be a candidate for a hip replacement if the pain experienced interferes with their daily routines and activities they are expected and want to perform, only though after less invasive treatments have been deemed unsuccessful. Damage to the hip joint from arthritis is the most common reason that one may need a hip replacement. This type of arthritis is developed as a result of wear-and-tear on the joints. It damages the cartilage that helps the joints move smoothly. Results from an overactive immune system and produces a type of inflammation that works to erode the bone and cartilage, causing joints to become deformed. In this condition the bone may collapse and become deformed from an inadequate blood supply to the ball portion of the hip joint. Pain that continues to persist despite use of pain medications. Pain that worsens with walking, even with use of an assistive device such as a cane. Observable changes in sleeping habits due to hip pain. Decrease in the ability to climb stairs. Difficulty rising from a seated position. If an individual does undergo hip replacement surgery they should expect to either be given a general anesthetic or a spinal block, which will only numb the lower half of the body. During the procedure the surgeon will make an incision and proceed to remove diseased and damaged bone and cartilage, while leaving all the healthy bone intact. The artificial material will then be inserted into your pelvic bone to replace the socket that was damaged. After surgery is over, individuals will enter recovery for a short time while the anesthesia wears off, where they will be closely monitored to maintain stable vital signs and a tolerable level of pain. The UPEASY lift cushion helps people who would otherwise need assistance getting up. It makes it easier to gently sit and rise from your chair or sofa. The seat lift is safe and easy to use, it will lift up to 80% of your body weight. After surgery there will be an increased risk of blood clots due to being immobile for a variable length of time. Therefore, soon after surgery candidates will be encouraged to sit up and even try walking with an assistive device and supervision, of course. Blood-thinning medications may also be prescribed after surgery just to prevent blood clots, depending upon your specific situation. Individuals should also expect to participate in physical therapy services after a hip replacement to work on function and mobility with the goal of speeding up the recovery process. Keep an open mind though, because recovery and improvement of strength in your new hip joint could take up to as long as 12 months. This incredible Car Caddie Helping Hand is a car strap that offers a helping hand for getting out of cars, trucks, or vans. It is easy to install. 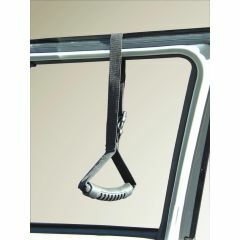 Just roll down your window and put the end of the car caddie strap around the window frame. Even though the recovery period could last almost a year, it will definitely be worth it because the pain once experienced will be greatly reduced. Individuals should expect the new hip joint to not only reduce their pain, but they will most likely notice an increase in the mobility of your new joint as compared to what was removed…which will allow for further participation once again in most of their daily routine activities. However, individuals should not expect to participate in everything they once did because high-impact activity such as running will most likely be too stressful on the artificial joint. 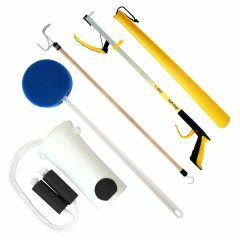 This is a convenient collection of essential items to assist with bathing, dressing and activities of daily living. 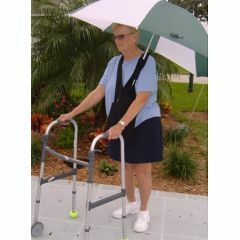 Includes products most often recommended by therapists for people rehabilitating from hip join replacement procedures. Ultimately, although hip replacement surgery comes with various risks…the reward of greatly decreased pain, along with an increase in mobility prove to outweigh the risks. Individuals who can participate in their own daily routine as long as possible seem to have greater self-esteem and self-worth, which overall leads to a healthier and happier life. Life is short, so if you are thinking a hip replacement may make yours better…do not hesitate to consult with your healthcare provider today to go over your options. Since 1997 Allegro Medical has been a leading supplier of hip replacement supplies to healthcare providers and consumers. If you are recently undergone a hip replacement, rely on AllegroMedical.com for all of your hip replacement needs. A migraine is an intense headache that can cause throbbing, or a pulsing sensation, in an area of you head…it basically feels like your heartbeat has migrated upwards to your head. It’s not comfortable at all. Unfortunately too, migraines are usually accompanied by nausea, vomiting, and extreme sensitivity to both light and sound. Therefore, if you’re in a room that is bright and loud, your migraine will seem to be that much worse. The pain that migraines cause can last for hours to days, and it can even hurt so much that all you can think about is finding a dark, quiet place to rest until the pain subsides. Some individuals will notice that their migraines follow the same pattern and are preceded by an aura (an event that signals to them that a migraine is coming on). An aura can be anything from flashes of light to tingling in the arm or leg that signals another migraine is coming on. The specific cause of migraines is not currently understood. Most likely, genetics and factors in the environment play a strong role in their development. Migraines may be caused by changes in the brainstem area and how it interacts with the trigeminal nerve, which is a major pain pathway in the human body. Also, imbalances in brain chemicals may also be a culprit to the development of migraines. Specifically, a chemical known as serotonin that is responsible for regulating pain levels within your nervous system. The levels of serotonin during a migraine attack decrease, so if there aren’t enough chemicals to regulate the pain, it will result in more pain for you and possibly a migraine. Fluctuations in estrogen levels seem to trigger headaches in this specific population. Hormonal medications such as oral contraceptives and hormone replacement therapy may either make migraines better or worse. Aged cheeses, salty foods and processed foods may all trigger migraines. If you skip meals, or decide to fast…that can also trigger attacks. Alcohol and other beverages that are highly caffeinated may trigger migraines. Missing out on too much sleep or even getting too much sleep can both trigger a migraine. Physical exertion that is more intense than an individual is used to can trigger a migraine. Once you approach your healthcare provider and explain your situation with the development of migraine headaches and you are definitively diagnosed, a treatment plan will be implemented for your specific case. Migraines cannot be cured; however there are ways to manage your symptoms and condition. Generally, medications to help treat migraines fall into two categories: pain-relieving medications and preventive medications. Pain-relieving medications are the ones that are taken during your migraine attack with the goal of stopping symptoms of your headache that have already begun. 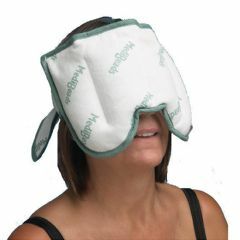 The migraine caplets on the right are great to relieve your pain. Preventive medications on the other hand are those that are taken regularly, usually on a daily basis, with the goal of reducing the severity and/or frequency of future migraine attacks. 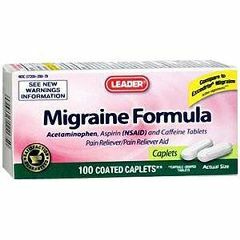 Includes medications such as aspirin, Advil, Motrin and Tylenol which are best to relieve mild migraine pain. Also includes migraine-specific medications that can be purchased over the counter, such as Excedrin Migraine that may help to ease moderate migraine pain. Works by tightening blood vessels and blocking the pain pathways in the brain. 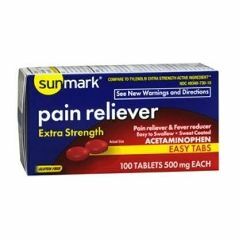 Medications may include such as sumatriptan (Imitrex) and almotriptan (Axert). May cause nausea, dizziness, drowsiness and weakness. Not recommended if you are at an increased risk of stroke and/or heart attack. Ergotamine and caffeine combination medications are less effective than Triptans. 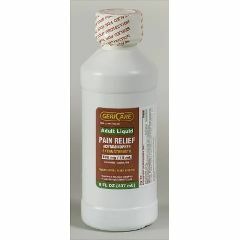 Most effective with pain that lasts for more than 48 hours. Include medications such as Migergot and Cafergot. Migraines are usually accompanied by nausea, so being medicated for this complication could make your attack slightly more tolerable. Medications include those such as Reglan and chlorpromazine. Contain narcotics such as codeine and usually used for those who cannot take Triptans or ergot medications. They are habit-forming and are usually only used as a last resort. Preventive medications may also be used for this condition, depending upon how your signs and symptoms present themselves. Preventive medications can reduce the frequency, severity and length of migraines and may also increase the effectiveness of other medications that are being used during migraine attacks. Ultimately, migraines should not be taken lightly because if left untreated over an extended time period, the pain that an individual is caused may begin to interfere with the daily routine…so do not ignore signs and symptoms, it’s better to be safe than sorry! Since 1997 Allegro Medical has been a leading supplier of migraine and headache supplies to healthcare providers and consumers. If you are suffering from a migraine or headache, rely on AllegroMedical.com for all of your migraine needs. The Cure Medical U Shaped Pocket Intermittent Catheter is a high quality DEHP and latex free product that always has fire polished eyelets that are smooth and less irritating. The U Shaped packaging enables men to discretely carry the product in a pants pocket. The best thing about this product is that it comes with a convenient one time use lube packet. 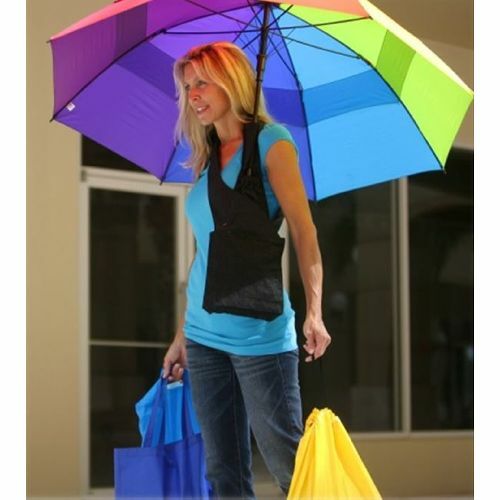 No need to carry around a separate packet or tube anymore! Cure Medical designed their catheters to have the least amount of trauma upon catherization because of their unique fire polished eyelets. These eyelets increase comfort when inserting and reduce the risk of UTI’s. Cure slits the catheter and then melts the tube for that smooth eyelet versus other catheters that only have the eyelet cut. Below you can see the differences between a Cure Catheter and others on the market. Allegro Medical supports Cure Medical in their research for a cure. Help support the research with the purchase of Cure products at Allegromedical.com. Since 1997 Allegro Medical has been a leading supplier of medical supplies to providers and consumers. Rely on AllegroMedical.com for all of your catheter and incontinence supply needs. Our customers have asked and Allegro Medical has listened! We are now proud to announce we are staffed with bilingual customer service representatives that are here to help you with your every need. Our friendly customer service center now staffs representatives that speak Spanish! We understand the frustration one can have while shopping online where one may have specific questions but struggle finding someone to call to assist. Don’t be afraid to give us a call at 1-800-861-3211! We are available from 7am to 7pm Central Standard Time from Monday through Friday. Nuestros clientes han pedido y Allegro Medical ha escuchado! Ahora estamos orgullosos de anunciar que cuentan con personal de representantes de servicio al cliente bilingües que están aquí para ayudarle con todas sus necesidades. Nuestro amable centro de servicio al cliente ahora tiene representantes que hablan español! Entendemos la frustración que uno puede tener mientras que hace las compras en línea donde uno puede tener preguntas específicas, pero luchar para encontrar a alguien que llame para ayudar. No tenga miedo de darnos una llamada al 1-800-861-3211! Since 1997 Allegro Medical has been a leading supplier of medical products. If you are looking for an extensive selection of medical products, rely on AllegroMedical.com for all of your needs!